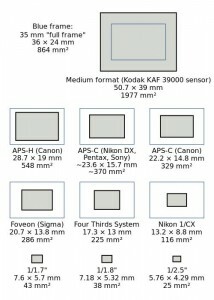 Confused about all the different digital sensor sizes? Don’t feel alone. There may be more than you realize. Take a look at the chart below. The blue outline is the standard 35mm format which is actually 24mmX36mm. 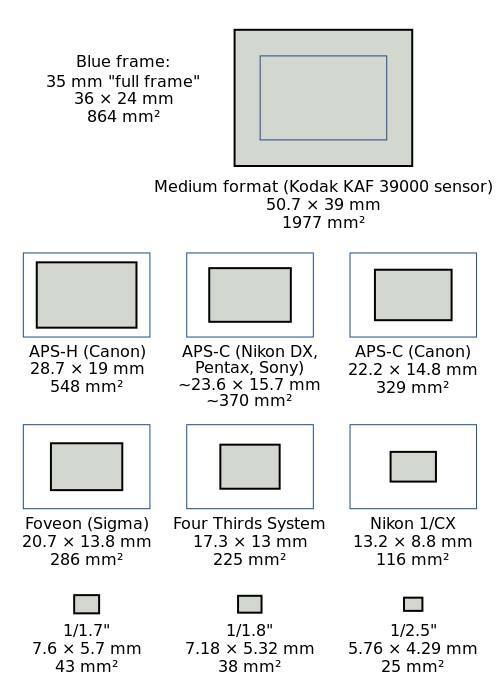 The many different sized digital sensors compared with full 33mm film. Click for larger image. On a 35mm DSLR, the sensor size determines how much of the normal scene gets captured. A cropped sensor as it’s called captures more of the center part of the scene while a full frame sensor captures a wider view. Cropped sensors usually have about as many pixels as their full frame counterparts but they have a higher pixel density and the pixels are smaller. The higher spatial resolution provides a magnification factor. The Canon APS-C for example has the magnification equivalent of 1.6X that of a full frame. This can be a real advantage for long lens shooting. A 500mm lens on an APS-C body for example gives the same view as an 800mm lens on a full frame as demonstrated in the windsurfing image. 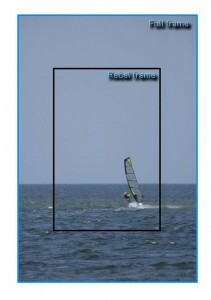 That advantage is quickly lost on the other end of the focal length range however. Zoom advantage of cropped sensor. Click for larger image. A 20mm lens, a super wide with an angle of about 94°, becomes the equivalent of a 34mm lens with an angle of view of only about 63°. 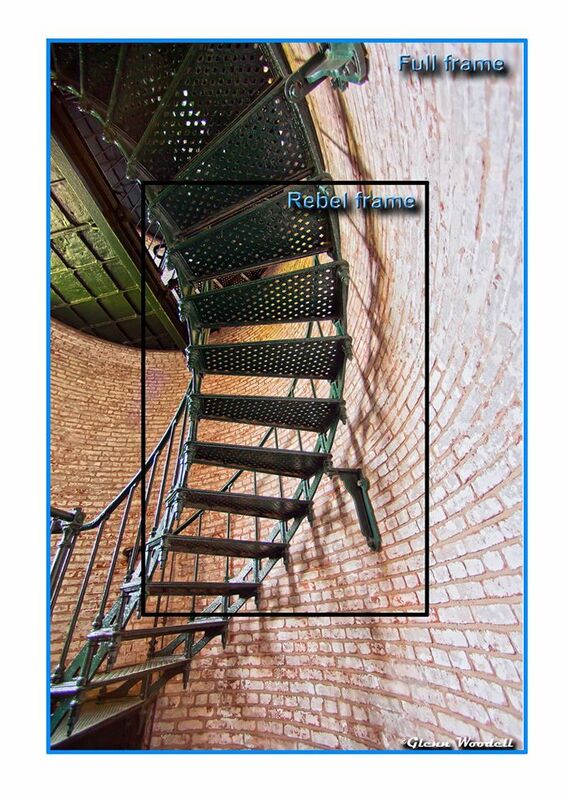 This becomes a huge issue when shooting in cramped spaces where you can’t step back far enough to get the shot as demonstrated by the lighthouse staircase image. Disadvantage of cropped sensors. Click for larger image. Another drawback to the smaller sensors, since they usually have smaller pixels, is that these small pixels gather less light and therefore their signal-to-noise ratio is less. The result is poorer performance at higher ISO values – noisier images. So, when deciding on a camera, which one is better? Well, that all depends. In my case I use both full frame and crop sensors but I use them in such a way as to get the advantages of each. For all of my low light work, where my ISO values will be 3200 and up as high as 12800, I use my full frame Canon 6D. And for my long lens work, I almost always grab the 7D MkII with the cropped sensor. With the long lenses I’m almost always shooting below ISO 3200 and I get to take advantage of the magnification factor. For a really good and entertaining narrative on the many different formats, take a look at “Crop or Crap” by Zack Arias.